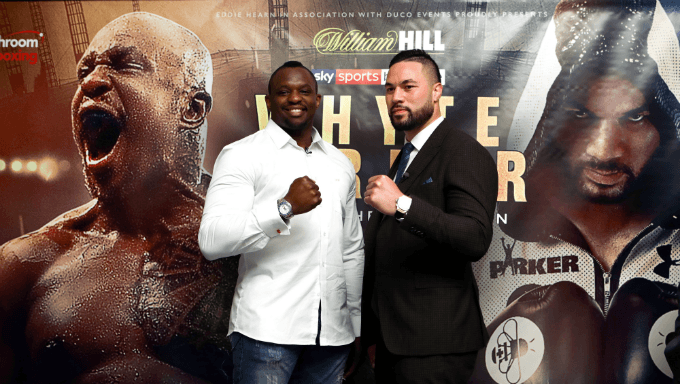 Heavyweight contenders Dillian Whyte and Joseph Parker clash at the O2 Arena in London on Saturday, July 28 in a bout many expect to lead to a world heavyweight title opportunity for the winner. According to top oddsmakers, Parker is a slight betting favorite headed into the bout which makes sense because he’s proved capable against world class opposition while Whyte has yet to win above the domestic level. Whyte vs. Parker fight can be streamed in the U.S. via Sky Sports Box Office pay-per-view for $26.14 (£19.95). As heavyweight contenders go, Whyte and Parker are impressive performers. The two one-loss competitors lead a solid group of contenders helping make the division as formidable as it’s been in over a decade. Whyte, Parker, Luis Ortiz and Jarrell Miller are noteworthy contenders eager to catch up to the likes of titleholders Anthony Joshua and Deontay Wilder and former champion Tyson Fury. The winner of Saturday’s bout will certainly warrant consideration as an opponent for one of those three heavyweight stars. Both Whyte and Parker have already been in the ring with unified heavyweight champion Joshua. Whyte was stopped by Joshua in seven rounds in December 2015. He’s the last fighter to face Joshua with no world title belt on the line. Meanwhile, Parker won the vacant WBO heavyweight title against Andy Ruiz via majority decision in December 2016. He defended it twice before losing a unanimous decision to Joshua earlier this year in a unification bout. Whyte is rated the No. 6 heavyweight in the world by Ring Magazine and No. 5 by the Transnational Boxing Rankings Board (TBRB). Parker is No. 4 according to Ring Magazine and No. 3 per the TBRB. Whyte (23-1, 17 KOs) is riding a seven-fight win streak with four of those wins coming by stoppage. In April, Whyte notched a solid sixth-round knockout over previously undefeated contender Lucas Browne. He’s a hard puncher with good power, and while he doesn’t possess the same level of technical precision Parker has shown, he’s very aggressive and always eager to make things rough. Against Parker, he’ll need to turn the bout into something like a bar fight in order to notch the win. Parker (24-1, 18 KOs) is coming off a loss for the first time his his career. Against Joshua, his slow feet were a detriment to his chances of pulling the upset because Parker struggles at times to cut off the ring. At his best, Parker is a slow-moving but highly-skilled heavyweight who runs opponents into his punches. He throws compact combinations, and while he failed to let his hands go against Joshua, he’ll need more output against Whyte to get the win. The most likely result of the fight is Parker winning a close decision. While Whyte is always aggressive and ready to rumble, Parker is likely to outbox him during the early rounds and as the two tire late in the fight, his more precise punches will probably carry him to the win. There isn’t much value playing the outright win market in this fight. Parker, the likely winner, is the favorite per William Hill at -125 and Ladbrokes at -137. Even if you like Whyte in an upset, there isn’t much to gain from calling it as he’s pretty much at +110 across the board. Parker winning a majority decision seems like a good play. Ladbrokes posts the odds at +2200 giving great value on the return should it happen. While Parker is probably a step above Whyte, it’s reasonable to believe Whyte’s natural aggressiveness, along with the fact that he’s the UK fighter facing a New Zealander in London, will give him a good chance to steal close rounds. Ladbrokes also gives +1400 on a split decision win bet for Parker. The same reasoning used above could also work in this case.